This energy saving LED enclosure light can be mounted to any metallic surface and helps perform operations and maintenance in the field. Energy saving lighting system suitable for all types of panels and enclosures, especially where space is at a premium. It is made of transparent plastic. This lamp has a very long service life (around 60,000 h.) thanks to the use of LED technology. The power output allows up to 10 lights to be connected to each other (daisy chain) with both the input and output plugs snap-locking into their sockets. LED, 120° angle of radiation. -30 ºC to +60 ºC. Connectors with snap lock for power supply and power output. Energy saving LED enclosure light, available with different voltages and frequencies. 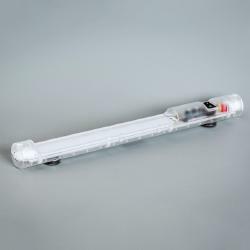 The enclosure light provides a compact and flexible solution as it can be mounted to any metallic surface. The light ensures both, operation and maintenance procedures can be performed safely, in the field.